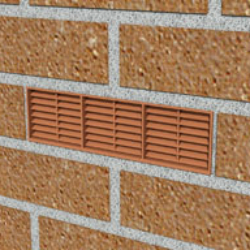 Wall vents are now a critical factor in building design and construction, helping with the control of airflow within combi-boilers, cavity walls or underfloor voids. Many of our vents are manufactured using polypropylene or similar lightweight, high strength materials. This generally makes the vents less expensive, as well as being easier to transport, handle and install. Our modern vents also come with accurate airflow figures, making it easier to choose the right ventilation product for any particular application. Check out Manthorpe’s stackable, easy to fit airbricks and accessories as a ready-made solution for through-wall or underfloor void ventilation. All of our wall vents are fully resistant to UV – a great choice for easy installation, low maintenance and a long life expectancy.